Although it never replaced traditional cooking, the microwave oven has merited a special status in American kitchens. Like computers, cell phones, and Furbies, microwaves have seen a drastic price decrease since their introduction to the public. If you wanted to be among the first American households with a tabletop microwave oven 50 years ago, it would have set you back $495 (over $3,600 today). 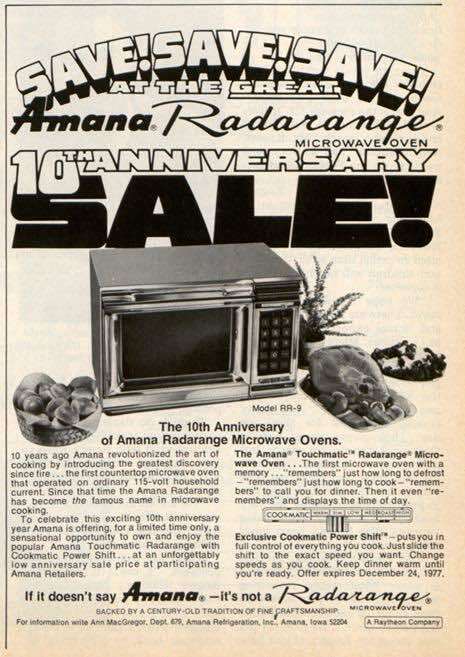 The first model on the market was the Amana Radarange. This revolutionary appliance was more than just a box to nuke your Easy Mac. In 1968, a color ad in the Post showed the Radarange with the bountiful spread it was capable of creating: an entire turkey, lobster, pork loin, and a whole eggplant. “No more slaving over a hot stove. No more scrubbing pots and pans. No more need to prepare food hours in advance,” the promotion boasted. Despite its ambitious intentions, the microwave oven never completely replaced traditional cooking methods. Home chefs have found the charring and crisping capacity of flame to be unrepeatable in a microwave. The gadget has become a mainstay in the American kitchen, though. From 1986 to 2001, the percentage of U.S. households with microwaves jumped from 25 percent to over 90. In 1976, the Post published an explainer on the microwave oven, saying “the ‘heatless’ cooker is thoroughly unconventional, with mild overtones of the interplanetary.” After all, the 1945 invention of the space-age oven is credited to Raytheon engineer Percy Spencer. 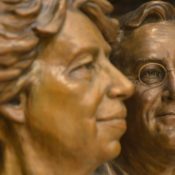 He was working with the radio waves of a magnetron and discovered the radar component was melting a chocolate bar in his pocket. After isolating the waves in a metal box, Spencer found the radio waves could be used efficiently to heat food, or, rather, the water molecules in the food. The Post’s 1976 article also warned of the “taboo” of metal in microwave ovens: “Metal reflects microwaves, shoots the energy back to the magnetron tube, thus causing arcing, a sort of aurora borealis over a baked potato.” The write-up concludes with two microwave recipes for readers to try: Teriyaki Sirloin Strips and Chinese Rice Crab. The preferred appliance of college dormitories is quite capable of cooking Asian rice recipes and ramen noodles, but these days microwave cake in a mug and microwave potato chips are some nuking favorites. Perhaps the best feature of microwave ovens is that, after 50 years, the price has gone from $495 to free. Due to the indestructible nature of the contraptions, it seems there is always one to be inherited. Read “For Galloping and Catering Gourmets,” by John Bayliss. Published May 1, 1976 in the Post. A thing that now most households own. Had melted due to microwave. And a good job promotion gave. Spencer got a job well done hand.